We want you to be as comfortable as possible during your stay with us. Here is a list outlining what to bring to treatment at Canyon Vista. Please note our guidelines. 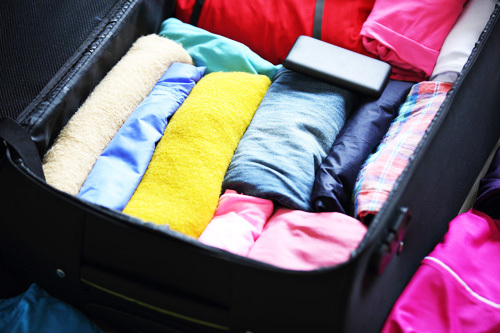 Try to bring at least two weeks’ worth of clothing upon admissions. We do have washers and dryers on campus that are used by all residents. Shorts and skirts that go past your fingertips when your arms are straightened by your side. Pants that fit comfortably and do not have any holes/tears in them. Tops that cover your stomach when your arms are raised above your head, shirt straps that are at least 3 fingers-wide. For possible access to an off-site pool, women may bring a full-covering one piece swimsuit or a tankini that fully covers the midriff. Men may bring loose-fitting swim trunks or shorts. Arizona is very sunny and bright, so you may want sunglasses, hats, and sun lotion. Toiletries such as shampoo, conditioners, hair products, hair stylers, toothpaste, toothbrush, deodorant. and make-up. (**Many toiletry products have alcohol, and we monitor the use of those products. If alcohol is listed in the first 3 ingredients in any product, we ask you do not bring it. If the product is necessary, we will safely hold it during your stay at Canyon Vista**). $5 refundable fee to purchase a lock to secure belongings. Additional spending money of $50-$100 is suggested for “incidentals” such as prescription refills, toiletries, cigarettes, and any other items that are not pre-planned for. We encourage you to discover, or re-discover, any healthy hobbies you enjoy. Therefore, if you like arts and crafts, writing, painting, playing guitar, etc., please feel free to bring the tools to participate in those activities. One outside novel will be allowed upon approval. We will help to answer your treatment questions.